A team of Russian motorcyclists turned to their own skills as engineers to design a helmet of the future. 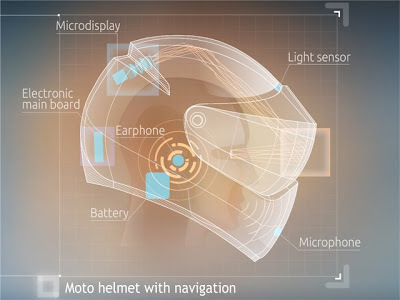 With an augmented reality GPS system built directly into a this lid, the visor has a full-color, translucent image running a version of Android which is controlled through voice commands. The engineers at LiveMap, a Moscow based company, became tired of the frustration of paper maps and touch-screen navigation systems. These motorcycle riders reached into the world of fighter pilots and pulled out a practical solution for riders around the world. With support from Moscow Department of Science, Industrial Policy and Enterprise; State Foundation for Assistance to Small Innovative Enterprises in Science and Technology of Russian Federation; Skolkovo Foundation the project creators are still seeking donations using crowd funding. For $100 contributors can help the project succeed and attend a "Launch Party" in a location nearest to them. For $1500 contributors are guaranteed one of these incredibly high-tech devices. our own minimalistic interface that will be used instead of standard Android interface. The project creators have 25 days to raise the needed funds to complete the creation process and launch production by 2014.